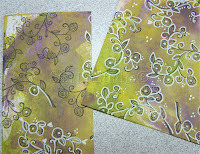 Ellen Hutson told me about a stamping method called a 'bandana technique'. I googled it, and found Robin Beam's blog that detailed how she developed this technique. 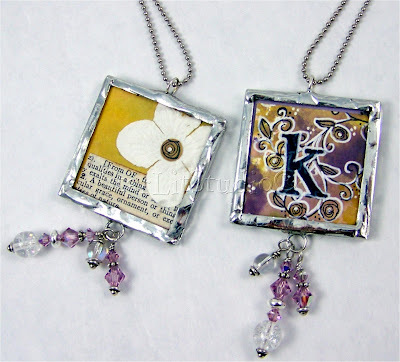 These monogrammed pendants were created as gifts utilizing this technique. Ellen stated this technique was a hit at the Ranger booth at CHA last week, as they utilized Ranger's new White Opaque Pen (StarLitStudio will be carrying this as soon as it ships!). Using a white gel pen I had here from Signo, I mimicked the technique. The dots were difficult to do with the Signo pen, and the coverage was not consistent. My hopes are Ranger is going to answer wishes for a 'quality, reliable, white opaque pen!'. We'll see once it gets here. I created background paper by dragging the glass droppers from various Distress reinkers (Peeled Paint, Dusty Concord and Scattered Straw) on a non-stick craft sheet, then misting generously with water. Holding a 4-1/4" x 5-1/2" piece of white cardstock (papertreyink.com) I pressed the cardstock down onto the inked craft sheet, and spun the cardstock ninety degrees. Messy? YES! But fun..... :) Next, I lifted the cardstock off and hung on my studio clothesline to dry. I did this three times with three sheets of white cardstock before all the ink was used up. Once dry I ironed them flat. You could iron them immediately or use a heat tool, and not wait to air dry, but it was after one o'clock in the morning when I did these, so I hung them to dry and started again in the morning... ;) I chose Lockhart's Millinery Rose stamp, because I think it is a nice, flowing, whimsical flourish. The rose flourish was stamped with Archival Ink in Jet Black (Ranger), then I outlined parts of the stamped images with the opaque pen: doodling, adding hearts, dots and generally being silly and non-conforming - it was fun, and the effect...dramatic! 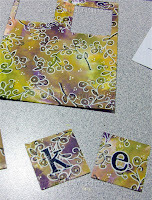 The monogram (Hero Arts) was stamped with the same ink, then centering the monogram I punched it out using a square punch. I sandwiched the monogram square along with another decorated square for the back (Prima flower and vintage dictionary snippet, and one of the rose flourishes for the Prima center!) between two panes of glass, taped, soldered and added jump ring and crystal embellishments. Soldering how to post here. Thank you for stopping by! I'm changing my name...it is now Kennifer!!! Gorgeous Cindy! My maiden name starts with a K! What a cool look! Thanks for sharing the details. WOWZERS Cindy! These are truely TRUELY gorgeous!!!!!!!!!!!!!! These are really cool! Can't wait to try it... I bought a soldering kit a few years ago and have never used it... I will now! Thanks for the tutorial. so glad you enjoyed the technique. You did an awesome job and you'll love the pen! I'll be back often to see what else you've made! Fabulous pendants, Cindy -- love how you created your own bandana print! You will LOVE the Ranger white gel pen -- no clogging or skipping at all!